It can simultaneously capture dual HD 1080p signals with each channel at 1080p/60, including DVI, HDMI, VGA, component signals and composite SD analog signals. XI200XUSB innovatively adopts USB 3.0 interface, which can realize high-speed transmission. 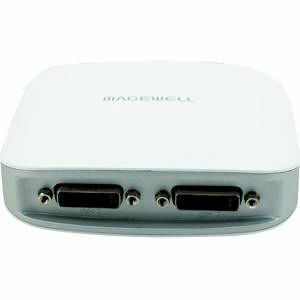 It captures dual HD signals simultaneously. The device gets power from PC directly and has no need of extra power adapter, which enables to be carried easily. You can capture high-quality non-compressed 1080 HD video by this mobile capture device. Compared to PCI-E interface, the Intel USB 3.0 chip enables a nearly 50% faster data transmission at 1080p60. XI200XUSB is compatible with USB 2.0 or you can get an extended USB 3.0 by a PCI Express card. It can capture and display uncompressed HD and SD images. It supports YUY2, UYVY, RGB24, RGB32, I420 with the best image quality. It can capture and display uncompressed HD and SD images. It supports YUY2, UYVY, RGB24, RGB32, I420 with the best image quality. The image will be captured as what it is instead of compressing the video and losing or lowering the image quality. The recovered color is clear and vivid. Your creativeness will fully do itself justice by the high-quality images. It adopts USB 3.0 interface and large volume image buffer technology which can easily achieve higher transmission rate and quality. Color space switch, image mirror scale or de-interlacing will be done within FPGA, which largely reduce the workload of CPU. It has the self-adaptive equalizer, and support 30-meter HDMI input cable. It fully satisfies user's requirements in specific situations. It has the feature of Simultaneous Streaming. You can run multiple applications simultaneously while all of them use the single video source. Each channel will affect the frame rate.